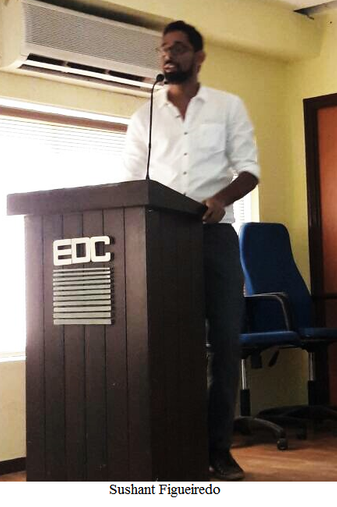 An awareness programme (part of a series of programmes) on the hazards of electronic waste was held at EDC House, Panjim, in June 2017 by the NGO Communicare Trust in collaboration with NASSCOM (National Association of Software and Services Companies) Foundation, CEAMA (Consumer Electronics and Appliances Manufacturers Association) and MAIT (Manufactures Association of Information Technology). This was part of the Digital India Initiative that has begun pilot projects in Bhubaneshwar, Puducherry, Guwahati, Imphal, Indore, Kolkata, Moradabad, Ranchi, Patna and Panjim, to combat the issue of growing electronic waste in India. This was part of the Digital India Initiative that has begun pilot projects in Bhubaneshwar, Puducherry, Guwahati, Imphal, Indore, Kolkata, Moradabad, Ranchi, Patna and Panjim, to combat the issue of growing electronic waste in India. The e-waste project will be gradually extended to other parts of India to cover all major areas. 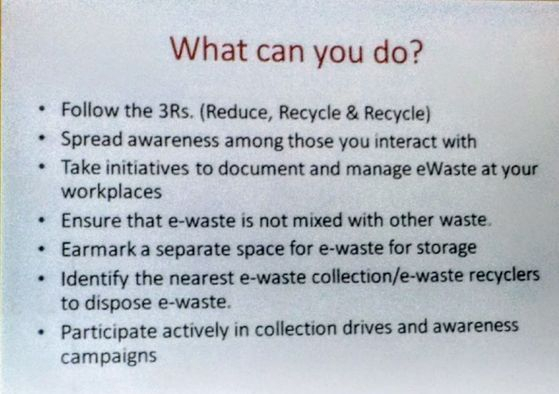 The objective is to reach out to schools, colleges, producers, consumers, bulk consumers, scrap dealers (kabadiwalas), dealers, etc, using the cooperation of local NGOs to educate them about the rules with regard to e-waste (2016), the problems related to it, and the proper manner of disposing of it. The project also involved an e-waste collection drive from 5-15 June 2017. Social and consumer rights activist Roland Martins elaborated on EPR or Extended Producer Responsibility, which confers the responsibility of collection and disposal of e-waste on national or multinational companies that produce electronics. While laws and regulations are in place, a pertinent question is how far does this translate into action at the level of rural stores? A large part of the effectiveness of EPR depends on the Government leaning heavily on these companies, which many a times is not the case. Martins said, ‘In Germany, you are given an envelope addressed to the company with the postage paid when you buy an HP cartridge. You can send the used cartridge back to the company. The same company operates in India but nothing of the sort happens here.’ Therefore it is up to the consumers to become aware of their rights and take the Government and the companies to task especially when this toxic e-waste is dumped in the hinterlands and on the periphery of cities. ‘Please understand that as consumers we have a responsibility to exercise our right to know. Then you have a right to say no. We are not fighting for just our rights as consumers, we are fighting for everybody’s rights as consumers,’ said Martins, while urging the audience to engage with the Goa State Pollution Control Board. Sushant Figueiredo was the spokesperson for Communicare Trust and made a presentation to caution the audience about the perils of e-waste. Any electronic and electrical equipment whole or in part discarded as waste by the consumer or bulk consumer, as well as rejects from manufacturing, refurbishment and repair processes, is categorised as e-waste as per the E-Waste (Management) Rules, 2016. 1.7 million tonnes of e-waste is generated per year in India. A survey by IMRB (Indian Market Research Bureau) in 2009 on E-waste Generation at the Source states that televisions and desktops comprise the bulk of the e-waste generated at 68% and 27% respectively, while imports and mobile phones are at 2% and 1 % each. But this survey was done in 2009 and we can expect the numbers to have grown since then, especially with regard to mobile phones. 70% of the total waste is from public and private industrial sectors, 15 % comes from households and the rest is generated by the manufacturers. Most people make the mistake of using the informal sector, or the kabadiwala, to get rid of their e-waste in the hope of recovering a bit of the money spent on it. The methods used by these kabadiwalas are neither safe to the workers involved nor to the environment because of the toxic gases, chemicals and heavy metals that are released during the process of dismantling products to obtain reusable and valuable components. Not only does this unprotected work cause illnesses in the workers, but it can lead to death prematurely. Most of the workers are poor, unskilled children and adults. By refraining from selling e-waste in the informal sector, we can help protect these lives from hazardous employment. We, the public, are affected just as badly since the chemicals and heavy metals tend to enter vital water bodies through the runoff from rainfall. Thus you have contaminated fish, vegetables and fruits, which will in turn poison you with their toxicity. The nervous system can be damaged due to lead in CRTs or Cathode Ray Tubes (cathode ray tubes are found in televisions and computer display screens) and printed circuits, and mercury found in wires and switches. Mercury from wires and beryllium from the motherboard can cause lung cancer. There can be harm to the foetus and hormonal imbalance due to lead and plastic (PVC). These are only are few of the harmful effects of e-waste containing a myriad of noxious chemicals such as arsenic, barium, lithium, copper, chromium, nickel, etc. The rules for e-waste management were notified in 2011 by the Government of India and came into force in 2012. They were amended in 2016 to focus on EPR wherein deposit refund (the consumer is charged a certain amount which is refunded when the product is returned) and buy-back schemes have been added as options. Some companies like Samsung take back products when they have reached their end-of-life and either reuse or recycle and recreate new products from the recycled components. Producers are now solely bound to collect e-waste. They will receive a single authorisation from the Central Pollution Control Board and a separate authorisation is not needed for collection centres in the EPR plan. 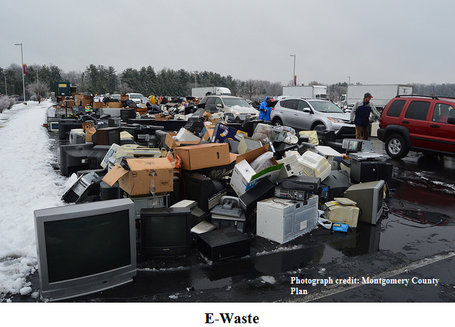 The rules for e-waste management now apply to manufacturers, dealers and refurbishers as well. Manufacturers have the responsibility of recycling the e-waste generated during the manufacturing process and dealers may be entrusted with the collection of products that can be construed as e-waste by the producer. CFL (Compact Fluorescent Lamp) and other mercury containing lamps have been classified as e-waste and involve a cost of disposal for the consumer. The amended rules include parts, consumables, spares and components of electronic and electrical equipment as e-waste. The State Government will have to provide a shed or industrial space for the recycling and dismantling of e-waste in the industrial estates. ULBs or Urban Local Bodies have been entrusted with collecting littered e-waste and directing it to authorised collection centres. Any e-waste mixed with other municipal waste must be segregated and collected by ULBs. There will be a penalty for harming the environment or third party and flouting the E-Waste (Management) Rules, 2016. Consumers can play an important role in decreasing the purchase of electronic and electrical products that are not absolutely necessary. We need the mantra of ‘reduce’ to thwart e-waste creating consumerism, coupled with the appropriate mechanism in place for recycling e-waste, to save our country from this deluge that threatens to drown us.